Looking for a fun reading program to keep your kids on track this summer? Or maybe you are looking to keep yourself on top of new releases and the classics. Portland libraries and national companies offer prizes for kids, teens and adults. 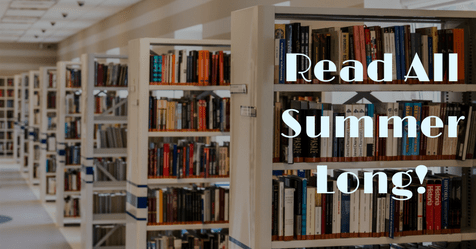 Find the right summer reading program for your family. The Multnomah County Library’s Build a Better World summer reading program begins June 15 and runs until August 31. It is broken into age groups: birth-8th grade, and grades 9-12. Pick up a game board at your closest Multnomah County Library. Prizes include tickets to Oaks Park, Oregon Ballet Theatre, Oregon Children’s Theatre and more. Find out how to play. Kids grades 1st to 6th get a FREE book when they read 8 books and record them in the summer reading journal. The program begins May 15 and runs to September 3. Bring the completed journal to a local Barnes & Noble between the given dates and your child will pick a free book from a select collection. They also have a list of summer reading for teens and adults. Have your child fill out this reading reward calendar and bring it in to a local Chuck E. Cheese’s for 10 FREE tokens. A food purchase is required to redeem the prize. The offer is valid through December 31, 2018. There is something for everyone with the Washington County Library reading program. Kids, teens and adults can participate. Starting June 1, win great prizes just for reading. You’ll get one free general admission ticket to a Portland Thorns or Timbers T2 soccer game and other prizes just for signing up. Go to your nearest Washington County Library to sign up. Starting June 1 until August 31, kids, teens and adults are invited to keep a reading log to win prizes and attend fun reading events at the library. Sign up at your nearest library and see the prize list. Kids, teens and adults can register online or at the library for the program that runs June 15 to August 15. See the prizes here, including a $100 Barnes & Noble gift card.